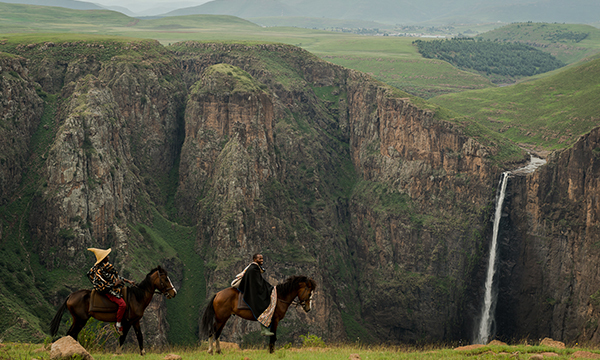 Find freedom while exploring the wilds of Lesotho from the saddle of one of our trusty, sure-footed Basotho ponies. Looking for a relaxed morning out in the fresh mountain air, taking in the scenery of the spectacular Maletsunyane gorge? Yes! Then be sure to book for a pony trek when you join us at Semonkong Lodge. Catering to all types of riders, from the experienced to the “I’ve never sat on a horse before”, our horses are gentle and sturdy – and will make you feel at home in the saddle in no time. Known for their endurance and used by Basotho’s as one of the main modes of transport in the rocky terrain, be amazed at how these reliable, good-natured animals take the foothills and rugged mountain paths in their stride with ease. Our most popular day ride winds through the local villages of Semonkong, where you will catch a glimpse of the daily lives of those living in them. As you head towards the viewpoint of the mighty Maletsunyane Falls, you will be able to take in the beauty of the Kingdom of Lesotho and enjoy the peace and stillness of mountains that surround you. Once at the waterfall, it’s time to stretch those legs and give the horses a breather, it’s also the perfect time to stop and marvel at Semonkong’s greatest natural wonder – one of the highest single dropping waterfalls in Africa, plummeting 186m into the gorge below. An unforgettable sight! This trek can be extended to a 5-hour ride, including Mount Quang – the highest mountain in the area where you will be able to see the national flower of Lesotho, the Spiral Aloe (Aloe Polyphylla). To all those experienced riders, we can guarantee a fast gallop along this route if you are up for it! 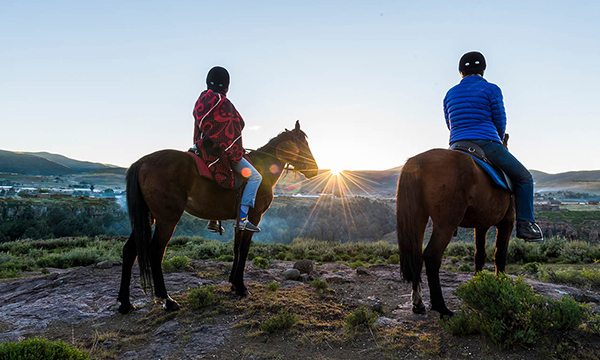 Semonkong Lodge believes in empowering individuals within our local communities, and we work together with the community in the hiring of horses, guides and traditional huts for overnight treks. Please note it is always compulsory to wear a riding helmet. These are provided for you at the activity hut. No open shoes are allowed. We recommend boots with a slight heel and long pants. 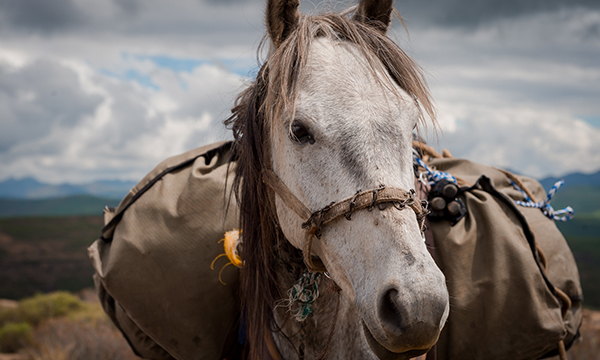 The sure-footed Basotho pony has been bred as the ideal form of transport in the rugged mountains and is the most effective means of reaching inaccessible mountain villages. Gentle and sturdy, they are ideal for people who might be a little out of practice or perhaps have not yet ridden before. We offer guided treks on these iconic ponies, starting from the lodge that wind through remote areas of Semonkong. Our trails range from 1 to 5-hour treks and start from R440 per person. Our most popular day ride winds through the local villages and towards the viewpoint of the mighty Maletsunyane Falls – one of the highest single dropping waterfalls in Africa. This trek can be extended to a 5-hour ride, including Mount Quang, the highest mountain in the area where you will see the Spiral Aloe (Aloe Polyphylla). Our 2 to 4 day overnight expeditions are an incredible way to immerse yourself in mountain life and Basotho culture. Our ponies safely navigate the remote trails and windy tracks through some of most beautiful, untouched places of the country. Each night is spent in traditional Basotho villages which have cooking equipment & eating utensils. The overnight rides are quite strenuous, involving 6-7 hours riding a day. It is, however, a great way for the complete novices to learn how to ride and to experience the wild of Lesotho. The accommodation is in traditional Basotho villages. Luggage is carried on packhorses – one packhorse is adequate for two people. Hikers who do not want to carry their heavy packs can also use the horses. Should your group want an additional packhorse together with the guide, it will be an extra cost per day. There is a maximum of 10 people for the pony treks. Baggage is limited to 12.5kg per person. No children under the age of 12 on overnight treks. Please book the overnight pony treks and guides in advance. Essential to wear hiking boots with a good heal. No sandals, flip-flops or takkies/sneakers.